Plasgwyn was previously a hotel which was owned by the Hughes family from 1970. In 1998 the family decided to convert the hotel to a purpose built 38 bedded Nursing Home. 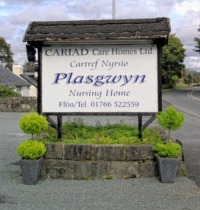 Plasgwyn Nursing Home is registered to provide round the clock nursing care by a highly qualified and experienced team of nurses and care practitioners. We provide Nursing, residential and respite services for adults mostly over the age of 65. Plasgwyn has established an excellent reputation for Palliative and end of life care and our aim is to ensure that our service users are all treated as individuals and with the utmost dignity and respect, ensuring they are well cared for in a friendly, clean, safe, and attractive environment. All our bedrooms are en suite and have been designed to the highest possible standards. All rooms have profiling beds and specialist equipment required to ensure our residents comfort and safety. Every room also has a LCD television and a telephone point. There are two lounges, a library and a family room and Plasgwyn also has its own hairdressing salon. Our cooks provide a wide range of delicious home cooked meals and cakes and cater to service users individual requirements. There are beautiful gardens set at the rear of the nursing home overlooking fields and Eisteddfa fisheries. The garden has been landscaped with sections of the garden adapted to cater for the physically disabled; permitting service users to maintain their own “plot”.